May 15, 2018 -- After years of development, researchers at the University of Alberta have succeeded in creating an environmentally friendly cyclotron that can produce enough medical isotopes for as many as 1,000 imaging scans a day. The device can produce technetium-99m (Tc-99m) and other nuclear medicine imaging isotopes using electricity, rather than having to go through a nuclear reactor. As a result, it does not produce any radioactive waste, according to an article in the May issue of Nuclear Medicine and Biology (Vol. 60, pp. 63-70). Cyclotron at the University of Alberta. Image courtesy of the university's Medical Isotope and Cyclotron Facility. "Unlike other nonreactor-based methods of producing technetium-99m, the product from the cyclotron is functionally identical to that produced from a reactor," said Jan Andersson, a researcher at the university's Medical Isotope and Cyclotron Facility, in an article from the University of Alberta. The cyclotron initiative began in 2010 when the Canadian government awarded a $3 million grant ($2.9 million U.S.) to the University of Alberta and the University of Sherbrooke in Quebec to develop a new type of cyclotron to produce Tc-99m and alleviate the shortage of medical isotopes in North America. 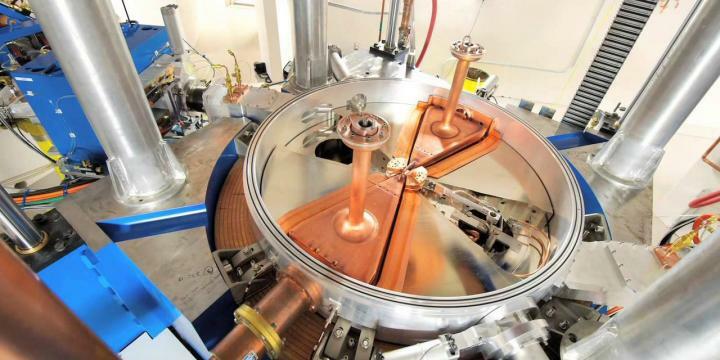 As the technology advances, the researchers believe the cyclotron could lead to the development of other radioisotopes. "When the technetium market dies, technology that is specific for technetium production dies because it can't be used for anything else, whereas a cyclotron can produce a variety of different isotopes for diagnostic imaging that are used in medicine," said John Wilson, manager of the university's facility.